* JUST SERVICED * SUNROOF* BLUETOOTH * FRONT HEATED & COOLED SEAT * FOG LAMPS * BACKUP CAMERA * ALLOY WHEELS * DRIVER'S POWER SEAT * PUSH START * DON'T MISS THIS GREAT DEAL! Call Us Today (630) 892-4300 Ask for Danny!!! 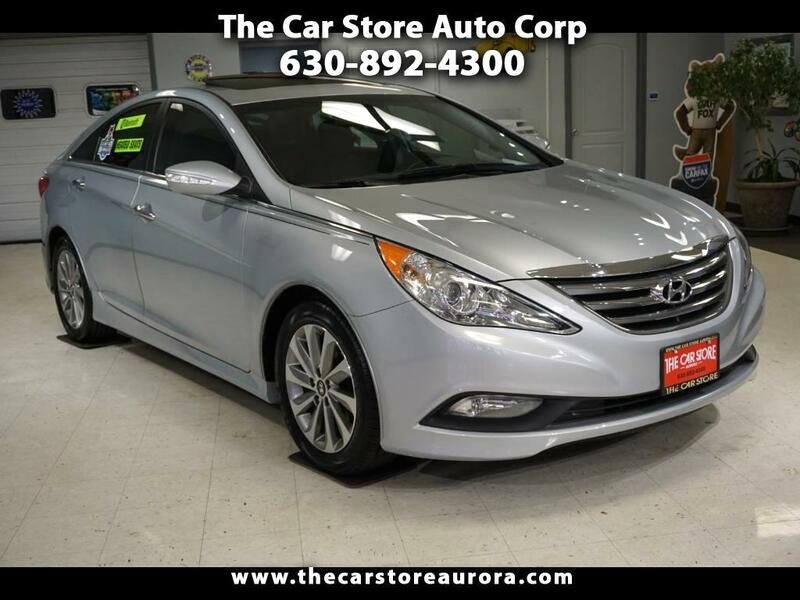 This 2014 Hyundai Sonata Limited is a great buy and comes with Bluetooth and Front Heated Seats. This Sonata simply put by Edmunds.com "Hyundai Sonata strikes a perfectly acceptable balance between comfort and confidence." Don't miss out this cool looking ride, come take it for a drive today! Please visit our website at www.carstoreaurora.com for all pictures and other inventory. Buy with confidence from a Carfax Advantage Dealer with an A+ rating from the Better Business Bureau. Please visit our website for the most up-to-date information on this vehicle and YouTube video. Proudly serving the Aurora, Naperville, Oswego, Yorkville area for over 20 years. Prices subject to change without notice. If you are looking for a 2010 Toyota Camry XLE, 2012 Hyundai Sonata GLS Limited Hybrid, 2009 Honda Accord EX-L, 2008 Ford Fusion, Nissan Altima, 2011 Kia Optima, 2014 Huyndai Elantra or 2015 Toyota Corolla LE please call us for availability. * We are an A+ Rated Auto Dealer with the Better Business Bureau. * Vehicles come with a free Carfax report. * Vehicles are detailed and Carfax Certified. * Financing is available through banks and finance companies. * Over 20 years serving your family and neighbors. "impressive is the turbo engine, which cranks out 274 hp"
"Its total passenger volume puts it ahead of every class competitor except the Honda Accord"
"comes at a price that's significantly less than most competitors"
"So how much of a contender has the 2012 Hyundai Sonata become? Not only is it a clear alternative to the traditional midsize safe bets, but we recently gave it the title belt in a comparison test against a 2012 Toyota Camry, 2012 Honda Accord, 2012 Volkswagen Passat and new Chevrolet Malibu. While Hyundai's midsize sedan may not be a class leader in every area, it is well-rounded and offers few drawbacks and tremendous value. All are still worth considering, however, along with the Ford Fusion and Nissan Altima. The related 2012 Kia Optima also matches the Sonata in many respects. But one thing's for sure -- the Sonata no longer finds itself in the middle of the pack."